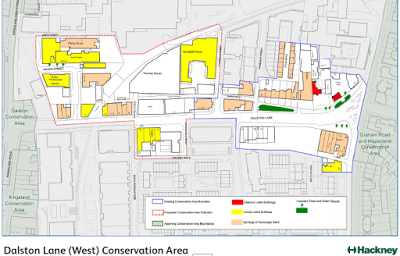 The following comments are responses to Hackney Council’s Draft Appraisal of the proposed Dalston Lane (West) Conservation Area extension and suggest that certain additions be made to it. Edwin Henry Horne, Architect, is known to have been commissioned by the North London Railway to design six of their railway stations - Bow, Hackney, Canonbury, Barnsbury, Camden Town (now called Camden Road) and Highbury & Islington. Two of those stations have survived - Camden Road (1870) which is Grade II Listed by Historic England and Hackney station which is locally listed by the Council. 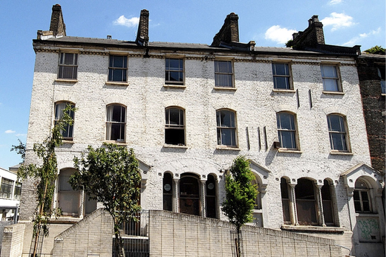 It has come to light that Edwin Horne was also the architect responsible for the design of many of the buildings constructed in Dalston on land owned by the North London Railway. 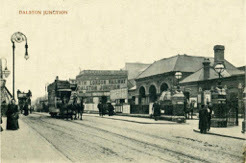 They were built shortly following the development of the Dalston Junction railway station which opened in 1865. The design of the north London Railway’s Dalston Junction station (demolished 2007) has been attributed by Edith’s Streets to Edwin Horne. It certainly bears some of his hallmarks, although we have presently no other independent corroboration. He would have been 22 years old in 1865, in the year of his professional qualification with George Rowden Burnell’s practice, when the station opened. 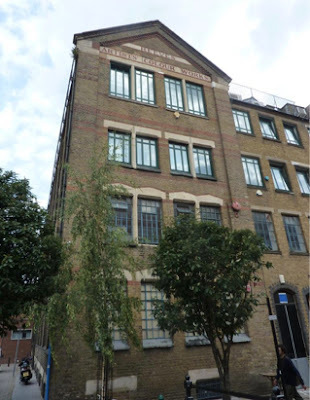 Edwin Horne designed the original Reeves and Sons 1868 Artist’s Colour Works factory building at 18-24 Ashwin Street. The characteristic red brick banding and decorative stonework again feature in the designs. 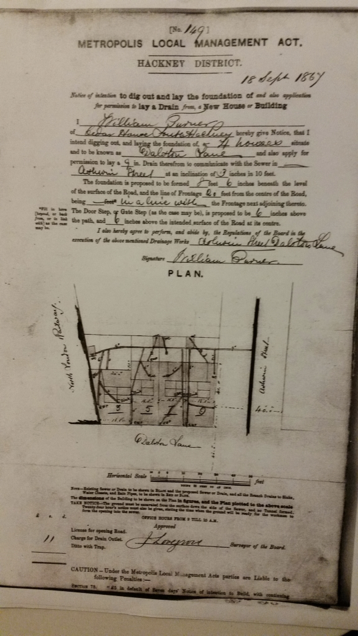 This notice of tenders received for the building, which appeared in the London City Press on January 18 1868, show that Edwin Horne was the appointed architect. The houses on the west side Ashwin Street (odd numbers), neigbouring Shiloh Pentecostal Church, were destroyed by wartime bombing in November 1940 and their site remains undeveloped today. The terrace of houses on the east side, 2-14 Ashwin Street, were designed by Edwin Horne. 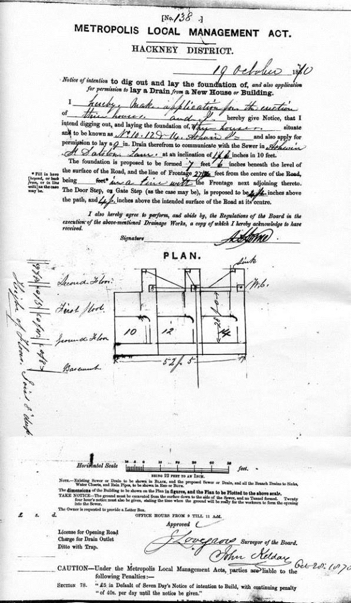 The building application to construct 2-8 Ashwin Street was lodged by Edwin Horne’s brother, the surveyor Arthur Horne, in 31 May 1867. 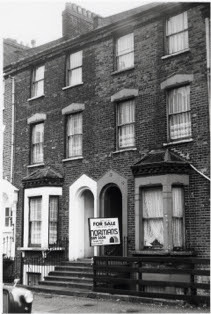 The houses of 2-14 Ashwin Street were transferred to Hackney in 1977 by Railtrack (a successor to the North London Railway). 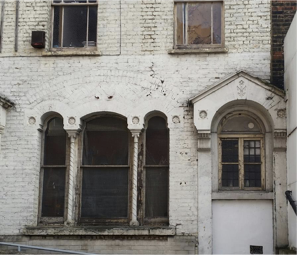 After decades of dereliction, and following a fire at No. 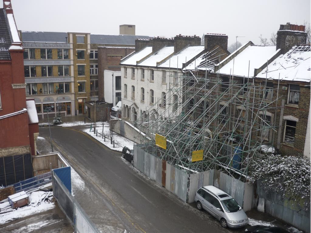 8 in July 2008, Nos.2 - 8 Ashwin Street (the scaffolded houses) were unceremoniously demolished by Hackney Council in June 2010. 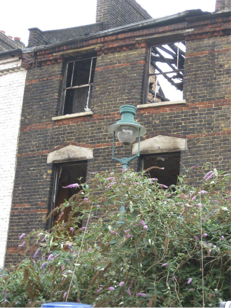 Number 8 Ashwin Street on the day following the 2008 fire – characteristic red brick banding, decorative stonework lintels and corbelled brickwork forming the eaves all feature. The design features of 10-14 Ashwin Street are more elaborate than the more modest features of the earlier houses in the terrace at 2-8 Ashwin Street. 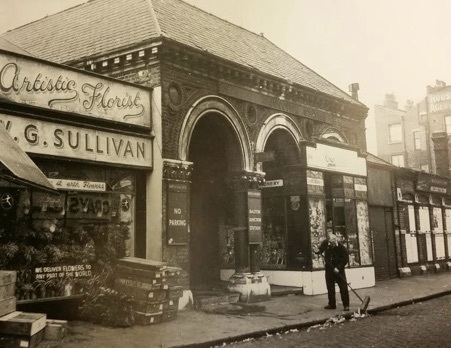 This early photograph shows the junction of Dalston Lane with Ashwin Street at the turn of the century. 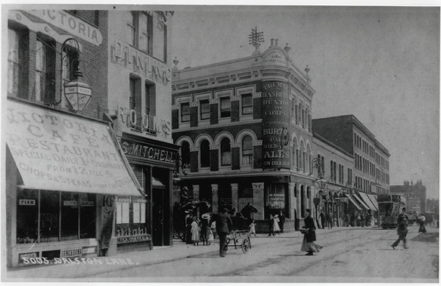 The terrace on the left comprised 3, 5, 7 and 9 Dalston Lane and on the opposite corner of the Ashwin street junction is the 1868 Dalston Junction Railway Tavern. 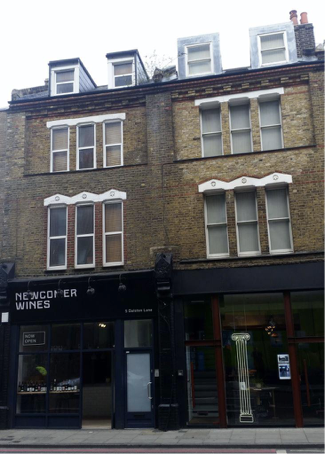 5 and 7 Dalston Lane, as they appear today, feature red brick banding, decorative brick corbelling below the eaves and the decorative stonework features over the first floor windows and on the ground floor – all are features characteristic of Edwin Horne’s designs in this period. 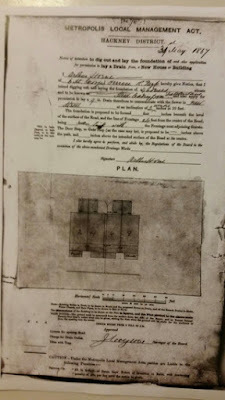 The terrace was designed by Edwin Horne and on 18 September 1867 William Turner applied to commence their construction. From index. August 1867 652 Shops Dalston Lane. Number 3 was demolished. Number 5 is locally listed. 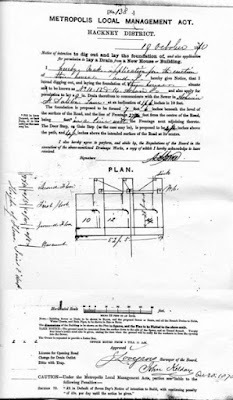 The application to build a public house on the junction of Ashwin Street at 11 Dalston Lane was lodged on 1 October 1868 by Chas Acock, who gave his address as 8 Ashwin Street which had been designed by Edwin Horne the previous year. 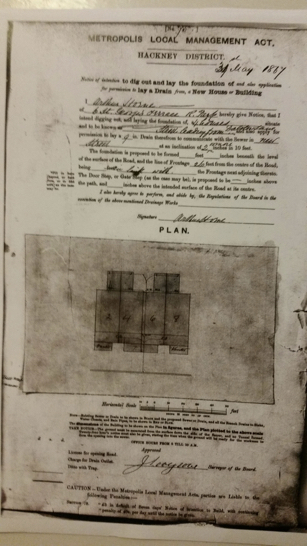 His plan references Mr Turner’s shops at 3-9 Dalston Lane, also designed by Edwin Horne. 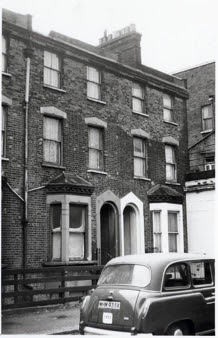 Chas Acock was later connected with the Old Ship Inn at 2 Sylvester Path, Hackney as Incoming Licensee in 1875 East London Observer. 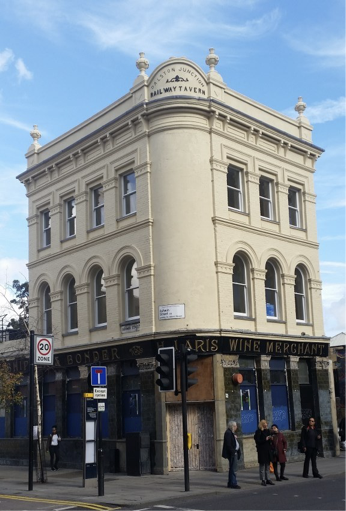 The Dalston Junction Railway Tavern has recently been refurbished by the Council. 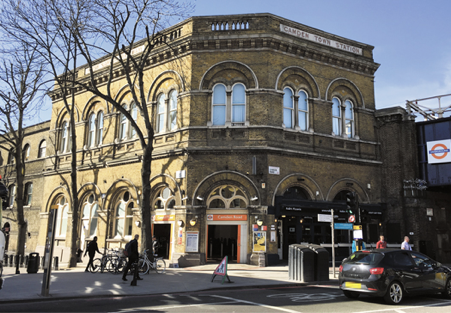 The Railway Tavern was built on North London Railway land and its architect is likely to have been Edwin Horne (to be verified) who was known to have designed in the Italianate, also called the Venetian Gothic, style ( for example Camden Road overground station pictured below). 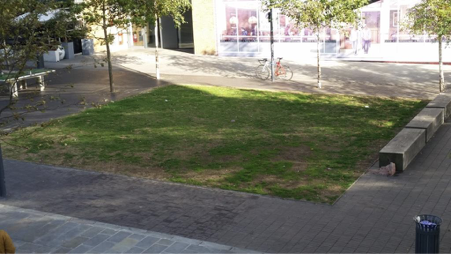 Various sites in Dalston town centre owned by the North London Railway were developed between, 1867 and 1870, to the designs of Edwin Henry Horne. The Reeves and Sons Artist’s Colour Works factory at 18-24 Ashwin Street, the houses at 2-14 Ashwin Street and at 3-9 Dalston Lane were all designed by him. 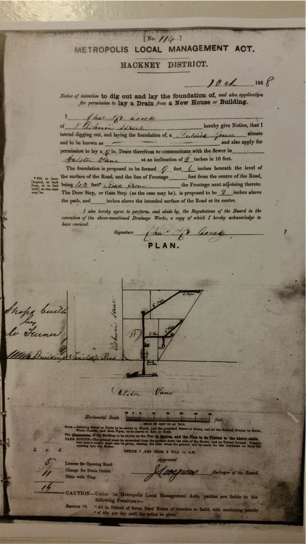 There is some evidence to suggest he also designed The Dalston Junction Railway Tavern at 11 Dalston Lane and may also have had a hand in the designs for the 1865 Dalston Junction Railway station. Edwin Henry Horne later, from 1870, designed six railway stations for the North London Railway in the Venetian Gothic style, and the architectural heritage of his two surviving stations has been recognized, particularly by the Grade II Listing of Camden Road station. 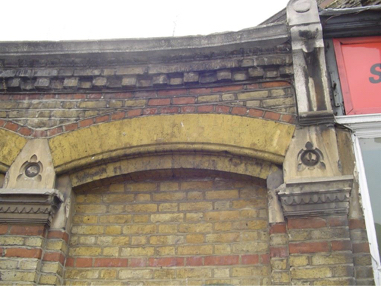 His career was cut short by illness but in Dalston we retain some fine examples of his work which are worthy of recognition and conservation. 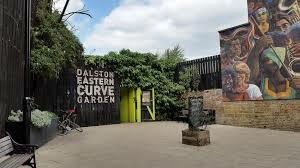 We consider that it is a serious oversight to have failed to illustrate the Eastern Curve Garden on the Dalston Lane (West) Conservation Area Map as comprising “Important trees and green spaces”. 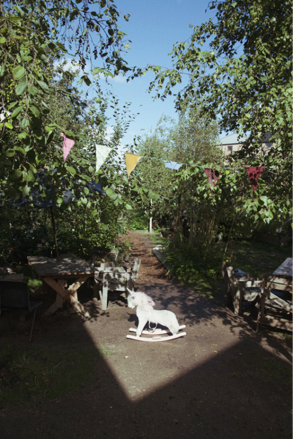 The land occupied by the Eastern Curve Garden comprises historic open space which was formerly a railway cutting. Trains emerged from the Dalston Junction station tunnel under Dalston Lane and continued along the eastern curve railway line to join the North London Line travelling east. 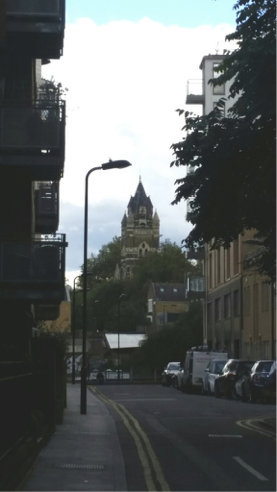 We consider that the view from Dalston Lane north out of the Conservation Area to St Mark’s church tower of 1880, framed by the buildings of Ramsgate Street, is an important view linking Dalston Lane visually, as it does, to the Grade II* listed church at the heart of the adjoining St Mark’s Conservation area. 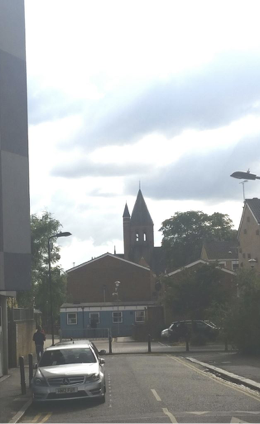 We consider that the views from Dalston Lane south out of the Conservation Area to the Grade II Holy Trinity church are important views linking, as they do, two areas of comparable historic development across land redeveloped more recently for low rise Council housing.